Hi everyone I cant believe its Friday again already! 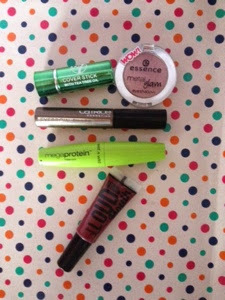 That means its time for the fourth installment of Budget Face in Products todays offering features products from W7, Essence, Barry M, Wet n Wild and Catrice. 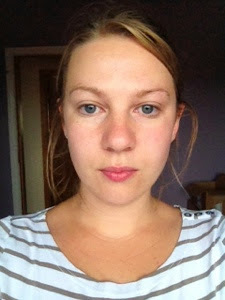 First up as I wasnt using any base was the *W7 tea tree concealer in shade light/medium. This is a stick concealer and did give fairly good coverage. It was a little thick feeling on my skin but I do put that completely down to the fact that I had no base over It. The shade matched perfect. This actually held up really well considering It was all that I had used and hadn't even been set with powder. For this look I just drew it on with the stick and blended a little with a real techniques sponge. This concealer comes in at €4.98. Next up was my brows for them I have used Catrice Eyebrow Filler this is an eyebrow gel with fibres to fill in gaps. I bought this as I had wanted to try this type of product since I heard of Benefit gimme brow. I just didnt like this Its not for me I need to at least try to sculpt my brows but this is for a more au-naturel look. for anyone who is looking for that look this would probably be a good product. It retails for €3.99 but I only paid €2 for it as part of a promo. For my eyeshadow I have used *Essence Matte Glam eyeshadow in Frosted Apple this isnt normally a colour I would wear but I gave It a go and It actually started to grow on me as the day went on. Its a pink colour with lots of sparkle, there is a good bit of fall out from the shadow but still a nice pigment and good staying power. The shadow retails at €3.09 and at that price I would definitely purchase in a different colour. Next on my eyes I used Wet n Wild Mega Protein Mascara. This retails at €2.99 and what can I say its a bit meh, I wasnt impressed with It and wouldnt wear again. Somebody who has naturally long curly lashes might like this but its just not for me. 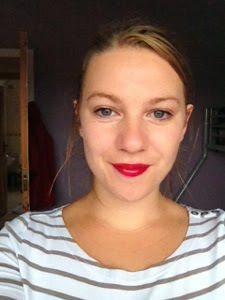 Lastly I went with a bold lip in the form of *BarryM Loud Mouth. This is a lip gloss/stain and has a very bold colour. the shade I used was Diva. It looked a really dark maroon colour in the tube but was actually a lot more wearable while on the lip. Its not sticky which is nice but is a bit messy so I used a lip brush to apply and would reccommend to do the same. This retails at €5.99. Todays look came in at the budget friendly price of €19.05! As always here is my before and after shots. I love when readers leave me comments and always read and reply to all.